Bobbie Berendson Wilcox is an independent artisan living in the grand cultural hub of American Fork, Utah. A classical illustrator by training, and a lifelong student of history, costume and culture, she brings a unique perspective to her crafts. Her passions include all of the senses and ways to enjoy them; such as food for taste, gardening for smell, art for sight, sewing for touch, and singing for hearing. She also practices with herbs and herbal/vitamin healing and health maintenance. She main tains a thriving household full of friends, family and felines, and spends her free-time contriving new ways to work herself into an early grave. Bobbie is the eldest of the six kids in her family where she learned how to make due in life with next to nothing. 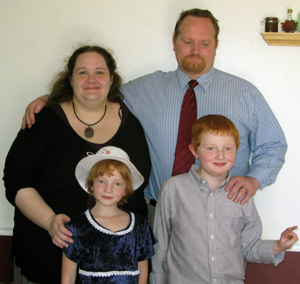 She is now happily married to Steve Wilcox and proud step mom to his kids Tim and Alexandria.